So I went to the dyno last weekend, put down 300+whp, which is great. But.. I was going lean at 5500rpm due to an momentary boost spike. Now this is off the wastegate alone no boost controller. After trying to rich the mixture up at 5500 rpm we hit a "wall" with the s-afc. It would not richin it up any further. So after doing a pull on the dyno and watching the afm signal on the s-afc screen, we figured the afm was "bottomed" out. Meaning it was being sucked in by the turbo to it's limit at around 5500rpm's. I verified this by taking the air filter off and pusing the afm cone by hand and having someone watch the afc screen to see the volt range..so my question is has any one else had this problem and how do I fix it rather than going standalone. **** anyone read this forum? pretty good numbers on a safc, how many psi??? also i really don't know how to help you about the afm but 300whp is insanely good, i would be happy to have thos numbers on my fc. im shooting for 270-280whp, my mods are: walbro 255fp rewired, aeromotive fpr, turbosmart bov, turbosmart boost controller, racing beat turbo back, safcII, T3/T4 turbo, spalm e-fan, koyo radiator, tid mod. I thought the T3/T4 turbo was to small(exhaust side) for an rotary? If I were you I would upgrade your primary injectors also, the 720's work well. **** it, I 'm gonna try 1000cc secondary's and see if the s-afc can tune those down better than it can tune the 720's up. pretty good numbers on a safc, how many psi??? Here ya go, You can see the spike at 5500rpm and the corresponding lean a.f.r. the exhaust side is .84a/r that's pretty big, with this turbo i can push upwards 300whp but i don't have a standalone to do that so im not going to go crazy on ths psi, maybe 11psi max. also with upgrading my secondarys only to 800cc im ok till 320hp or so, after that i have to go to 1300cc or bigger, deppends on what im going to do, but for now im sticking to the 270-280whp mark. also your boost spike is not to bad. it spikes from 12 to 14???? try porting your wastegate that would help your boost spike. hey man, just wanted to ask you, you did this on pump gas or race gas???? also i was looking at your dyno chart and your afr were quite lean for a tII, 12.6 is too lean try going for 11.1 or so that will help you and as i said port your wastegate it will help your spike problem. It was done on pump gas, and yea I have an external wastegate so I'm sure it's big enough. Went back to the dyno! and belted out about 340rwhp 300+ ft/lbs!, as stated previously I went for the 1000cc secondary's(as the only change) and they worked like a charm. The S-AFC worked great at lowering these injectors down. I even got to turn on my ebc as the lean spot was gone and turned it up to 15psi. My goal was 350hp w/ this setup and I came real close, I think I'm going to put on an meth/h20 kit and try to get it up past 350rwhp on the stock ecu and s-afc. impressive man, i think you are one of few if not the only one that has go that far with a safc and be succesfull, are you retarding your timing in any way????? im really curious if you haven't touch your timing. all in all good work man. Thanks man, I never touched the timing. With the right injector combo I think the s-afc is very useful and worth the money, as for the stock afm thats the problem. As it requires you to put these large injectors in. So Did U Do Ur Own Tuning???? No Steven Burkett at:http://tuxedoparkracing.com/index.html did the tuning. Well it was kind of an team effort, I watched some guages and worked the s-afc while steve told me how much fuel to add or subtract, and we both learned how to use the profec-b right on the dyno . 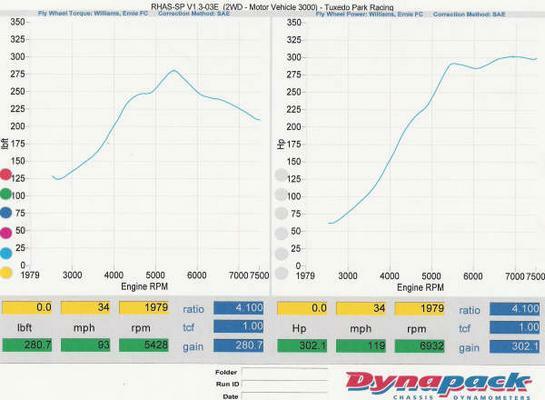 Dyno Chart actually 339 hp and 306 ft/lb torque peak. I have an another one but it will not upload it shows before and after tuning. 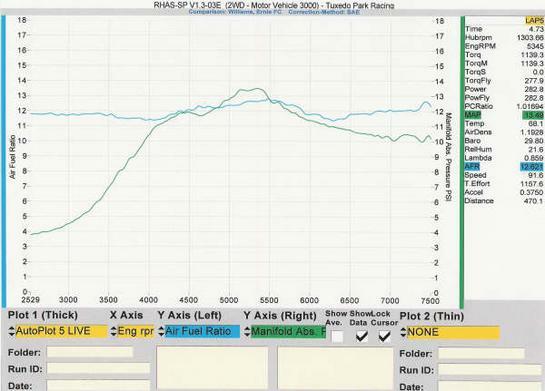 So basically I went from 292 hp untuned 10-12 psi to 339 hp tuned @ 15psi. 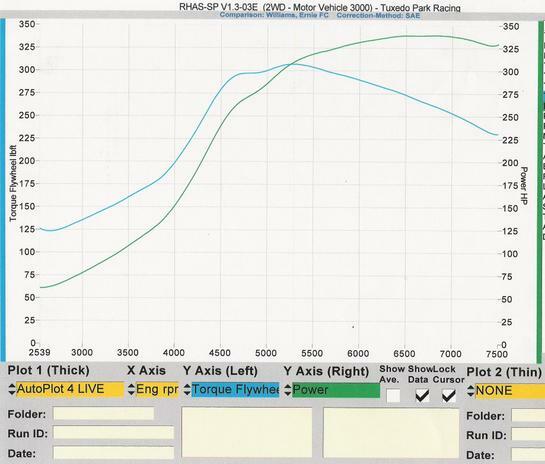 and torque went way up at 5000 rpm's from 240 ft/lbs untuned to 300 ft/lbs tuned! i actually just had this same problem when i went to the dyno a few weeks ago. i have a medium streetport, stock s4 turbo , full exhuast 3inch, 3inch tid, 800cc secondaries and 550 primaries, and an afc2. i'm assuming ur ecu is chipped since u are running the 720's in the primaries on stock ecu and not hitting fuel cut ? FYI.. if you go with an aftermarket ecu and remove your airflow meter and tweak the timing u'll probably gain another 30-40hp... at the same boost..
Stand-alone is definatly the way to go,but pricey, and since you not have an afm to worry about, you should have enough fuel. I believe I could have easily reached my horsepower w/ my original 720ccx4 inj. combo, w/ an stand-alone ecu. I wouldn't mess w/ the stock turbo unless it's an hybrid if your hp goal is anything above 300hp, an streetported motor needs something bigger. No my ecu has not been chipped, but i do have an FCD. The car has no trouble starting and does not flood, your thinking of s4 cars. nice numbers.. I cant believe the timing is being ignored... Awsome.